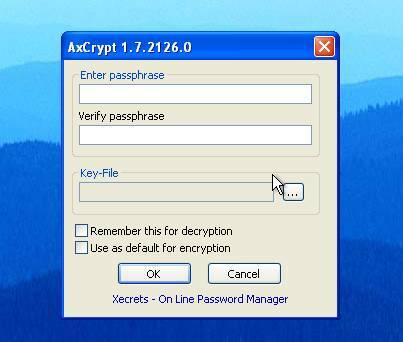 AxCrypt is a software giving you the possibility to encrypt files with a password and a keyfile which you both need to decrypt it again. You can either encrypt the file itself or a copy of it, in case you choose the latter the encryption output can be an executable file which does not need the AxCrypt software to be decrypted (but still the password and/or the keyfile). You may ask what kind of file the keyfile is - in case you let AxCrypt itself produce a keyfile, it is a simple text document with a short code in it. You can however choose any file you want as your keyfile (I have tested it with a .vbs script and a .wav file, both work) which offers a great deal of security especially against non-professional attackers. Upon decrypting you need all info you used when encrypting a file - the password as well as the keyfile, depending on which of them you used. If you send encrypted files to other people, the receiver will need AxCrypt installed if you have encrypted your files without choosing the option to produce an executable file. 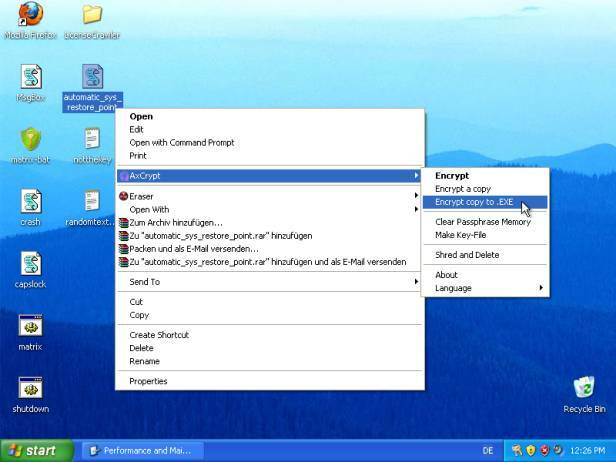 If you did however, the receiver will only need the keys to open the file, but no additional software installed. Thank you for the tutorial, was looking for one.